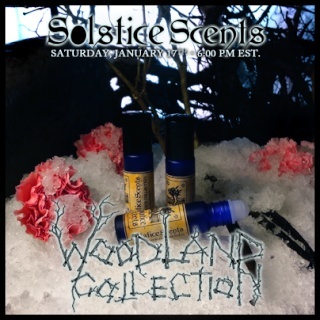 The Woodland Collection will be released tomorrow, Saturday, January 17th at 6 p.m. Est at www.solsticescents.com. A preview of the offerings is listed below. 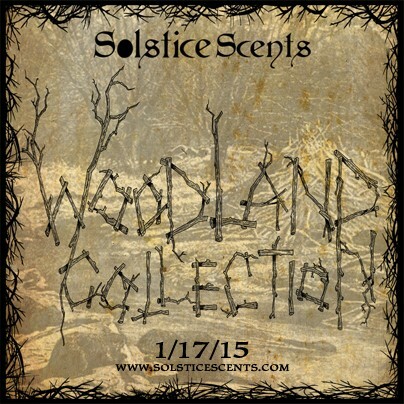 The Woodland Collection is a perfume only collection of 6 new fragrances. As always, a sample pack will be offered. 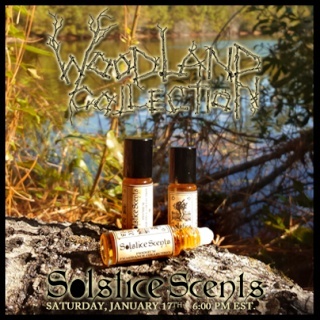 A limited quantity of Woodland Collection gift sets of all 6 perfumes will also be available. 2 of the 6 fragrances are Premium 5 ml fragrances. 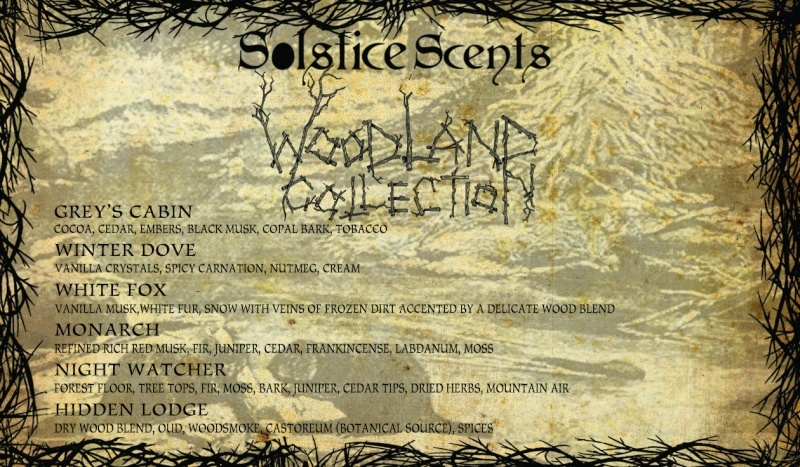 Along with the Woodland Collection, we will be listing the following DISCONTINUED fragrances: Spellbound Woods (Perfume and Glace), Blueberry Muffin Batter and Old Cedar Magus (Perfume and Glace). Spellbound Woods will not be restocked again when it sells out. 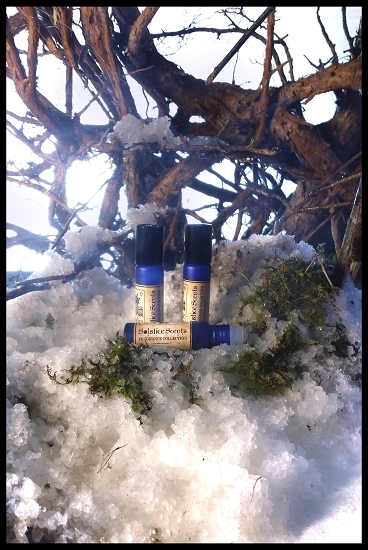 The other two may be restocked in perfume only, depending on remaining supply. A few other glaces will be added, along with facial toners. These items are in limited quantities. They will be located in their appropriate subcategories under the new "Other Products" heading. Please visit the home page to view the new menu configuration. Grey's Cabin is sheltered in a quiet copse of woods, well provisioned from the heavy winter just beyond the door. A warm blast of smoke and embers greets you upon application, coupled with cedarwood, black musk and a mug filled to the brim with rich hot cocoa. A hint of freshly baked spice breads sits on the far edge of the blend along with a subtle hint of tobacco. Grey's Cabin is a cozy fragrance to chase away the snowbound winter doldrums. Snuggle in front of the blazing fire on the comfiest couch with a Sherpa throw and an engrossing novel while sipping a creamy hot cocoa studded with marshmallows. This blend contains many notes including: chocolate fragrance blend, cocoa absolute, cedar, black musk blend, aged patchouli, smoke, tobacco, copal bark and labdanum with a faint trace of spices and marshmallow. It is very woody, chocolatey, smokey and musky. Unisex leaning masculine. The industrious beavers have built an impenetrable fortress in a quiet section of a small lake, deep within the woods. This hidden lodge is warm, dry and perfectly protects its inhabitants from the harsh winter conditions outside. 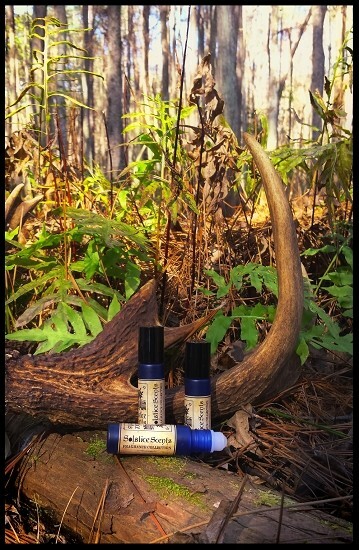 Hidden Lodge is a dry woody blend with traces of spice and smoke and delicate animalic undertones. The dry wood portion of this fragrance is comprised of a number of fragrance and essential oils. Sandalwood, copal bark, cedar and amber combine with additional wood aromas to produce a diffusive, warm, dry foundation for this scent. The addition of the woodsmoke with very conservatively applied nutmeg and clove enhances the incensey slightly-sweet woods. A touch of a botanical castoreum blend conveys a very subtle and enjoyable animalic hint to the blend. Natural oud adds a rich and intoxicating body to the total composition. Hidden Lodge smells very incensey, warm, woodsy, smoky and slightly spicy on the skin. The spices are more detectable after initial application and fade quickly to a subtle supporting role. On initial application, there is a sweet note similar to brown sugar along with a peppery zip. These nuances are an added dimension from the combination of wood and spice notes. Some of the woods in Hidden Lodge have a natural sweetness similar to that of caramel. Though this sweet characteristic is detectable, it is subtle and Hidden Lodge is not a sweet blend. Natural sandalwood and oud were used generously in this fragrance. Unisex. 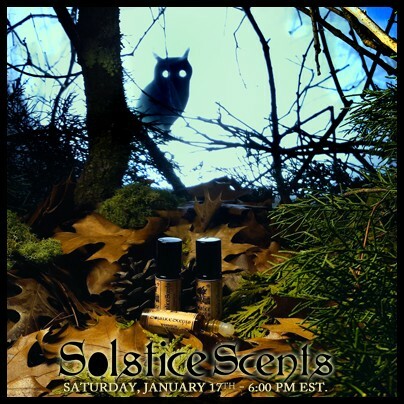 Night Watcher is a mossy, woody, coniferous fragrance with elements evocative of the woods at night. The mood of this fragrance is quiet and introspective yet watchful and alert. Cool stone, damp forest floor and plush moss combine with fir balsam, juniper and cedar tips to produce a woodland blend with a lot of depth. Dried herbs, along with a variety of other fragrance oils, were used to create a feather accord to suggest the presence of owl feathers. The result is a dry and musky note that adds an additional layer to the forest-heavy base. On initial application, the moss and juniper emerges first in a green sensory cloud. As the fragrance wears, additional elements arise. The feather accord is displayed shortly after the mossy opening. The fir balsam and wood notes come out after the fragrance has settled on the skin for a while. Many of the other notes may not be individually detected but rather suggest the abstract concepts such as mountain air and cool stone. Night Watcher contains a wide variety of essential and fragrance oils including but not limited to: dirt accord, fir balsam, juniper berry, cedar, moss accord, oud, sandalwood, vetiver, orris root, feather accord, amber, clary sage, nagarmotha, ambrette seed and more. Unisex leaning masculine. 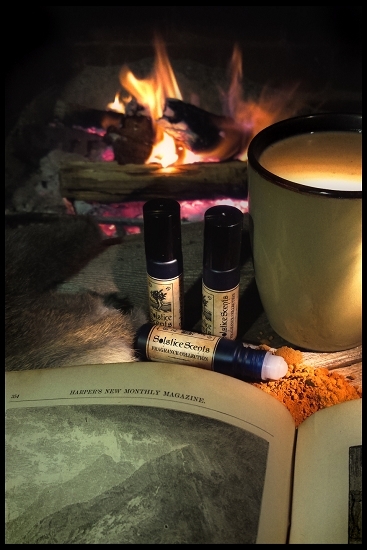 Women who enjoy atmospheric woods fragrances may also enjoy Night Watcher. An elegant skin scent featuring a soft vanilla core accentuated with notes evocative of clean silky white fur. The White Fox pads through snow laced with veins of frozen dirt. A delicate wood blend accents the composition. White Fox is heavy on ethereal vanilla with traces of woody-vanilla musk. Whispers of this entrancing aroma hover just above the skin. A cool subtle frozen dirt note swirls intimately through the scent, along with the carefully restrained addition of cedar and woods notes. Soft, gentle, beautiful and tenderly balanced. Unisex leaning feminine.